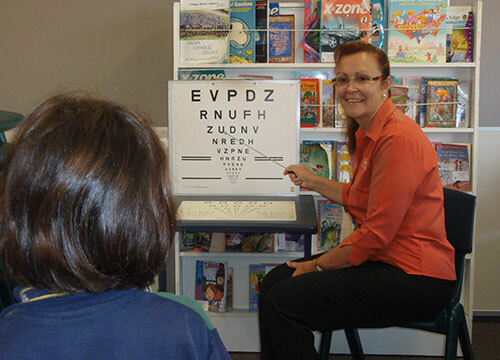 Did you know that Richard and our team provide vision screening at 12 schools in Hervey Bay EVERY YEAR. All grade 1 and grade 4 are offered FREE screening by Richard Watt Optometrist . Yes FREE, there is no charge for this service and we do not get paid to provide this service. Why do we do this? Because 25% of Australian school children have a vision problem and two-thirds of those children have never had an eye exam. We’re out looking for those children with undetected vision problems. About 1,000 students per year take part in the vision screening program. For the past 8 years we have offered a free vision screening program to year 1 and year 4 students across most schools in Hervey Bay. We found that year 1 and 4 are covering children at two different developmental levels. When we first offered this to schools saw the value in this. We are now contacted and pre-screen for prepies, but they are not ready for screening in that environment, so we found this more conducive in year 1 and 4. Carefully selected quick tests administered as quick tests for quick results, five hours of vision we screen for, pass or fail. A report goes home which if there are any fails on there are recommendations, a full eye examination, preferably with an Optometrist who is interested in children’s vision, someone who will take the time to make them feel comfortable to get the best results. They need to say a behavioral or developmental optometrist and is active in that industry, up to date with the latest technology and programs and development in industry. Richard does that and is the only one in the region that does that. We do not receive any subsidies, we do it because it’s a good thing to do and we care about eye health. One morning every couple of months, a low vision clinic operates at the Village Community Health Centre in Torquay Road. It is administered by Guide Dogs for the Blind. This is an advisory service assisting people who are losing their vision due to various types of eye disease. For these people, glasses no longer help and daily living tasks have become difficult or dangerous. Clients see how a wide range of magnifying aids may help. They also receive advice from a social worker on coping at home with poor vision. 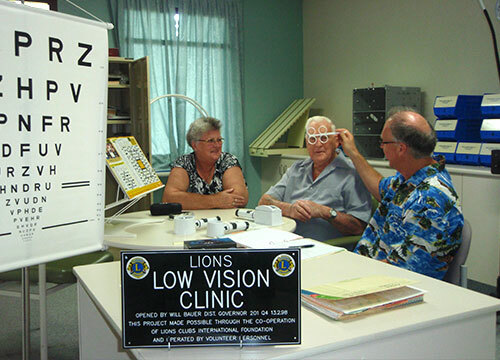 Richard volunteers at the Low vision clinic. 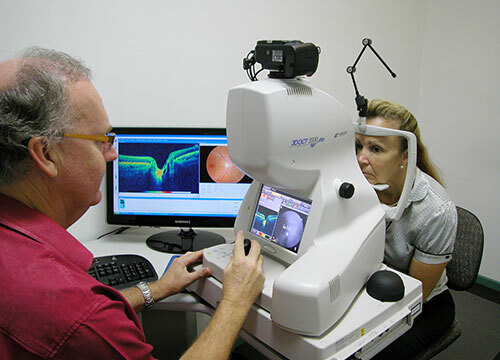 Richard is the only optometrist in Hervey Bay to be involved in these clinics in the past fifteen years. 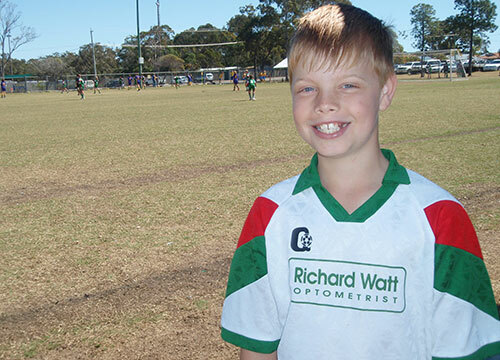 Our practice sponsors many local sporting clubs and teams. Richard and Gwen are active members of Bayside Christian Church. Richard serves in the Hervey Bay City Rotary Club. Both Richard and his wife Gwen have been honoured with Paul Harris Fellowship awards through Rotary. This is an acknowledgment of the service they continuously give to the local community. We are the major sponsor for AFL under 15’s at Bay Power AFL. Our kids played for them at one stage, they are a really nice club with a nice culture, they promote playing to the best they can but also playing fair. That fits nicely with our values. We’ve sponsored many soccer teams in the past and now we sponsor the sport in general by sponsoring Soccer Hervey Bay which enable them to maintain the grounds and look after the facilities to ensure the kids can play on well-kept grounds. We have always been involved in soccer, our boys played soccer, our grandsons play soccer here in the bay, and we love to give back. Involved in our church, Bayside Christian Church, they get involved in a lot of outreach programs, Christian based youth events. We support that with either advertising or with funds to subsidize for those young people who cannot afford their own registration to participate in those events, e.g. event registration and travel costs. We have taken on sponsoring St Michael’s School of Taekwondo Inc. Children can attend for free. We both feel very blessed to be able to serve Hervey Bay and our surrounding areas. We conduct regular visits to local nursing homes, we visit on site this is ideal for people that cannot come in, it provides greater access to industry professional that is experienced in elderly eye care and associated challenges. Their glasses are a mess, broken, 7 years old and haven’t had an eye test for years, they are struggling to see their t or read their novels or newspapers or play bingo, it’s quite limiting. They are frustrated that they cannot have a comfortable read of anything and all of a student hey can see the photos of the family that are sent to them, they can engage with news articles and other things. They often feel they are tool old, there’s nothing to improve, and then when we do get a great result and make a difference it’s a great feeling. By visiting clients in their nursing homes we are able to identify what their glasses and eyes have to do in their specific environment, which is different to what other people do in their environment. This gives us a much better understanding of what we have to achieve with elderly patients. For example, if they are bed ridden but like to read magazines, but have limited strength in their arms, we have to make a pair of specs to read at that distance. It’s no use to them to have a pair of glasses if items are held closer, due to limited holding capacity of tired arms. We factor all of these things into our tailoring because we are out in their environment. We try to help everyone in a way that is meaningful to them and a price that is manageable; with options to meet various vision needs and budget needs, to help people on various price scales. We really tailor our costs to meet those that have budgetary constraints, being mindful of their financial needs help us offer affordable eye care solutions. We have some great options for complicated / expensive lenses. As a result of working with Richard Watt Optometrist. When we deliver them, they are quite excited, they have quite a wow factor. Sometimes if their eyes have been using the wrong lenses for quite some time, it takes a while to adjust, but they are so thankful, we are able to watch TV again, we are able to read the paper again, we are able to see the food on our plate. But the frail and elderly those little things are so important, they are quite happy and grateful. One fellow said to us, more people should take the time to care for us old ep=people – thank you. And that was so lovely to hear. Once per year we have an open day, 27th October, progressive lenses day, it’s to learn more about progressive lenses, we have all the team from Rodenstock, the management, Optometrist in store, no appointments necessary (although they are a good idea), there to answers questions and to help anyone. Whilst you’re waiting you can enjoy a drink. We bulk bill for the elderly onsite visits.